Hey baby boy, WE made it to 40 weeks. You're pretty tight in there, and things have gotten harder, but you're still pretty cozy and I am still happy to have you inside. I am not rushing you in any way. We do our daily things together, homeschooling, preparing food, cleaning the house, shopping and planning... and you have allowed me to do it all. I am so thankful for this pregnancy. I didn't know I wanted to be a mother for the third time. The thought of going through pregnancy and birth scared me a lot before I found out about you. I didn't have two easy pregnancies or two easy births, both first pregnancies were hard and left me wanting it to 'just be over' at the end. With you though, what a difference...it makes me feel like I could do this again. I would have never 'thought it' when I was pregnant with your sisters. Anyway, since we are officially overdue, the doctor has set the date for next Monday, March 12th, a day after you complete 41 weeks. I am excited to meet you then, if that is the case, but I am still hopeful that you will surprise me and come before. I would love the experience of feeling contractions and deciding what time to go to the hospital with you, but either way, I am excited to meet you soon... maybe in 4 days! Your sister is so excited to meet you. She has been making a thousand plans of what she will do or where she will go when I go birth you. We are all so so excited! This week was a breeze. Yes, sleeping is hard and sometimes it feels like you’re falling out of my ‘you know what’, but the week went by so fast, and I got to enjoy so many days with my girls at home. For the first time I’m not in a hurry for you to be born. I can’t wait to meet you but I know you will be here soon and I’ll miss this part of life. Being pregnant and feeling you move and kick inside me is just such a wonderful feeling (most of the time). But, come now, before you grow too much in there and give me trouble. The waiting game has begun. I always wonder how it’s going to happen this time around. Will my water break? Will I start feeling contractions? Or will I wait til week 41 to see you? like both of your big sisters. Whatever way it is, I can’t wait to meet you. The last weeks are the ‘worst & best’. The waiting, the excitement, the anxiety. So much has already passed, I keep telling myself: I am patient, I can do this! The good news is, in less than 2 weeks I will meet you. Even if you decide to make me wait til the last possible minute, your time on the inside is coming to an end. I love you more than words can say baby boy, it has been a joy carrying you. All the little things that make your room super special. Teddy & Dino given to you by grandma. Letterboard, wooden box & blanket given by our friend Nay. Dr.Seuss book given by our lovely friend Kristi. School bus which was the first gift you got from us when revealed the gender to your big sisters. Every single detail was delicately chosen for you, my sweet boy! We are so excited to meet you soon. Hey there baby! Today your big sis took some photos of us. I absolutely love this shot and seeing how round my belly is with you inside. I’m so glad of the few photos I have of myself expecting you. I’m glad that big sis is so patient and enjoys photographing us. Week 23 and you're fine and cozy in here. This past week was successful and we did so many things like going to the mall, grocery shopping, organizing after grandma's move, preparing for our 'quick family session', between a thousand other things. On both Saturday and Sunday we had photoshoots and walked A LOT. After all the commotion, Monday morning came like a holiday to us. We needed the rest and my body let us know that. I could barely walk Monday with an intense backache, but I knew we were okay. I just kind of overdid it. Ooops! This new week has been slower in the walking and exercising department, but we got a ton of editing done and we did a lot of sitting and resting so far. We are mid week now and so ready to be back out there again! Hey there baby boy! A few things have changed this week out here. Grandma and grandpa have moved in with us and we will share their house until our new home is move in ready. We got a lot done, you and I, around the house. I did a lot of cleaning, organizing and making space for grandma and grandpa's things in the house. I'm glad that you have not made me feel so tired as you did those first 20 weeks. I feel like I can accomplish so much, yet sometimes I need to remind myself that you are number one and I need to rest for us. I also had a photo-shoot over the weekend between all the moving and I photographed the cutest twins. It reminded me of the first couple of weeks when I was scared to be carrying two in there because of the tiredness I was feeling. Everything felt so different than when I had your sisters, something had to be different. I'm so excited to meet you in 18 weeks but take your time in there. Love, Mamãe. Hey there baby! I've been feeling you more and more. You like doing your flips and kicks at night, right after my most needed warm shower. This week I craved loaded potato soup and I got to eat the most delicious one at Longhorn restaurant. I could definitely see us eating that more often. This set of photos were taken by big sister Yasmin, she takes such great photos of us. My goal for us next week is to get my hair cut/fixed, and maybe have a fresh look for some pics with you at 22! 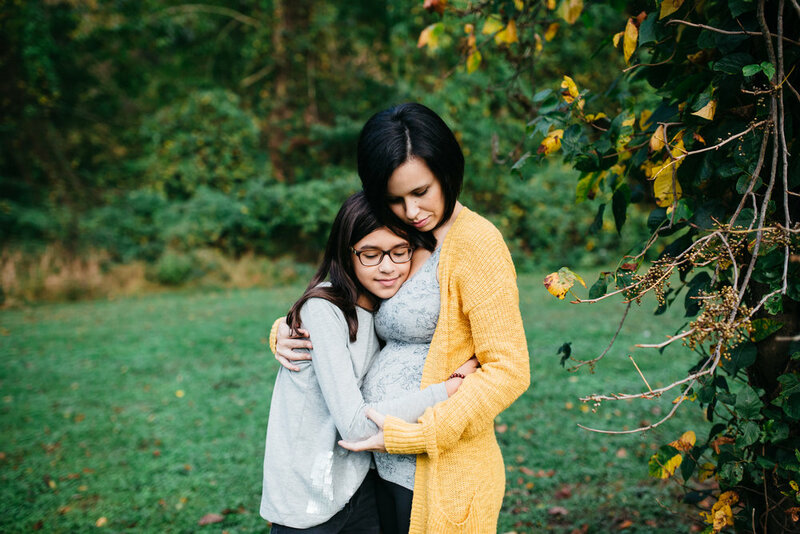 I finally got some bump photos with my "babies". Both big sisters participated and I even got some photos alone taken by both my mom and Yasmin. I hope I can keep up with taking some at least a few times a month, maybe once a week. Week 20 feels so good! I feel less tired than the early days though I still feel the need to rest in the middle of the day every now and then. This week I started feeling baby move and he is certainly a gymnast. While on my first and second ultrasound I saw how much he moved and I couldn't believe that I couldn't feel him. He was nonstop! Now that I feel him I can tell that he hasn't changed a bit. We've started calling him Gabriel and the name feels good. It's not set in stone yet but it feels right for our baby boy. We will be sure when we see his little face that this is the name for him. Halfway mark!